Governor Chris Sununu, the University & Community College Systems of NH, and FIRST ® New Hampshire are proud to present The Governor's Cup! What is The Governor's Cup? This unique one-day event will provide 2018-2019 FIRST Robotics Competition (FRC) teams an off-season competition with an extremely exciting potential reward for the graduating class of 2019 FIRST students. 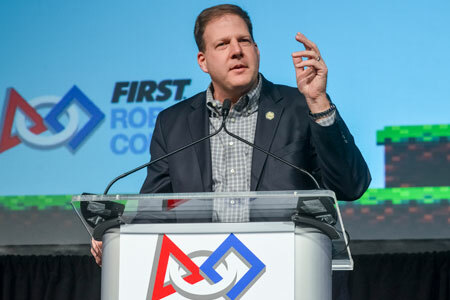 In keeping with his mission to build New Hampshire's workforce for "not just tomorrow but for five, ten, twenty years", Governor Chris Sununu has worked with the NH College & University system to offer FREE TUITION for a semester to up to 50 high school seniors who participate with their FIRST Robotics Competition team at the Governor's Cup. The Governor's Cup provides an opportunity for engagement with some of NH's best & brightest students & their families. FRC teams from all over the state will be in attendance. Come join the excitement of competition and see what these students have to offer. We will also be having some demonstrations of FIRST Lego League and FIRST Tech Challenge, this is a good time to come learn about these programs. We love our sponsors! As a non-profit, we could not do what we do without sponsor support. There are many different levels of sponsorship. Please click below to get started. The Governor's Cup will take place on October 13, 2018 at the ALLWell North facility at Plymouth State University. Teams will arrive starting at 8am, and opening ceremonies will take place at 9am. Closing ceremonies are planned for 5pm.